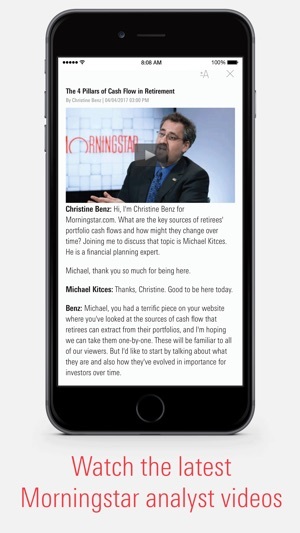 I have a premium account, and while a new subscriber, I use Morningstar data extensively. 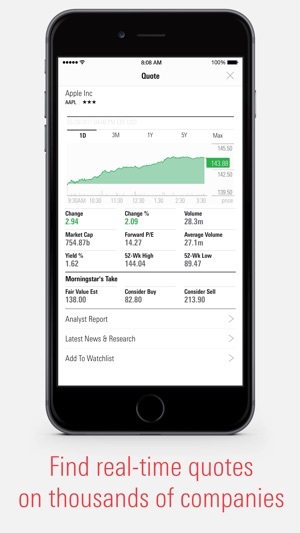 The portfolio tracking feature is nice on the iPhone, and I especially like that I can also follow the same portfolio on my iPad (which you can't do with Apple's default Stocks app, because it doesn't exist for the iPad). 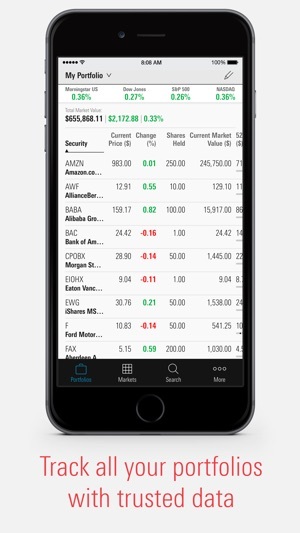 Sometime the portfolio view acts a little buggy. Sometimes it won't let me scroll up the page, initiating a page refresh (even if it just refreshed) rather than scrolling. After the refresh it starts working okay for a little bit. It's annoying, but it's manageable. 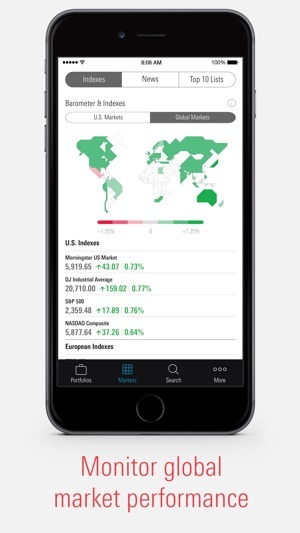 However, I really wish the iPhone app had all the financial data (10 yr history, key ratios, etc) that the website does. The iPad app comes closer, but really, I just end up using the website on both devices when I need full access to the financial data. 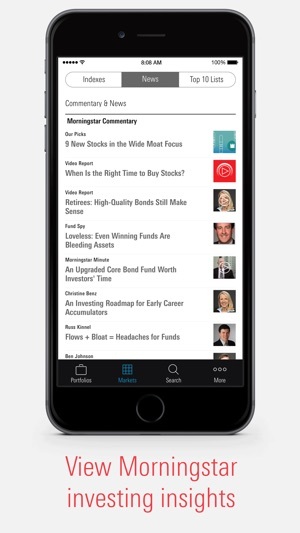 Great App for viewing all of your investments at once! Hi. Thanks for your vote of confidence. We are glad to hear that you find the app useful. 1. Revenue Trailing 12 months - to what use? 3. Consider selling price - " "
I'd rather have a quick view of Shares Held, Total YTD, Rank in Category, and Stars. Also, could you switch the Unrealized Gain/Loss columns so that the $ amount is to the left of the % amount? I've raised my rating to 4 Stars since Morningstar has added the ability to customize the columns displayed. Now would you please consider one more modification? Could all the $ columns be in green font and the % columns stay in black? Also, could you BOLD the Total Market Value column? Doing that would help set it apart from all the rest. Hi Heather - thanks for following up!